1. Ease of use and reliablity of functioning. 2. Secure attachment and to prevent damage, theft and vandalism. 4. Safe and balanced cycling on any inclination of slope, presuming cycling to remain on-road. Marvelo Bikes will be second hand and of varied frame size and style. Optimum equipment load on bike limited to 3Kg. (possible variation to 4kg if necessary). To avoid placing this bulk on the handlebars. Ideal position for bulk of weight is at bike fulcrum, i.e. bottom of cycle post, as near pedalling mechanism as poss. Attachment design to use boss fittings(threaded holes) in bike frame where possible. Also to consider distance apart of pedals for width of ‘box’/ ‘ bag’ attachment to frame, to avoid cyclists kicking it. Due to outdoor nature of activity, all equipment needs to be 100% waterproofed. Therefore most efficient, to where possible place all gear inside weatherproof skin that sits within the triangle of Bike frame beneath the crossbar. A Marvelo Bike needs to run on a battery system that can be recharged over night. Ideal would be to run for 8 hours of continuous use (considering work available to visitors from 10am to 6pm). However battery power required to manage this would require house sized batteries. Most likely we could manage 6 hours battery power within weight and budget restrictions. Power requirements of project are currently too high to enable pedal power to drive the system, although this possibility will be researched in Marvelo MkII. Most efficient to run Audio and Hive box systems off same power source. 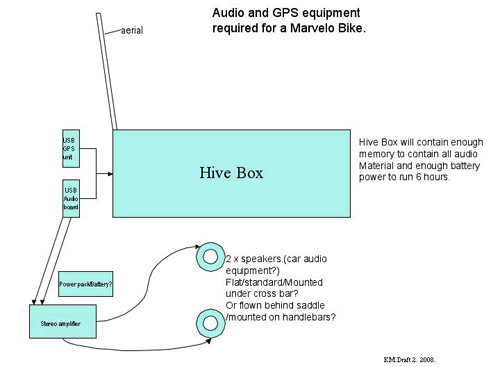 Power requirements for Hive box negligible in relation to Audio.